Avibras is considered a cluster munitions producer, based on the production of the submunitions carrying SS-60, SS-80 rockets after May 2008, the credible reports on the AV TM-300 and Avibras’ own statement in 2010 that it was involved in cluster munitions production. Avibras has not refuted this information, has not responded to PAX’ requests for more information and has not stated publicly that it would stop producing cluster munitions. [i] Avibras, “About us”, Avibras website (www.avibras.com.br/site/en/institutional/who-we-are.html), last viewed 9 April 2018. [ii] Prazares, L., “Brasil dá incentivos fiscais para armamento banido pela ONU”, UOL Noticias International website (https://noticias.uol.com.br/internacional/ultimas-noticias/2014/09/12/brasil-da-incentivos-fiscais-para-armamento-banido-pela-onu.htm), 12 September 2014, last viewed 20 September 2018. Avibras, “ASTROS and Skyfire were especially highlighted at Kuwait Aviation Show”, Avibras website (www.avibras.com.br/site/en/media-en/news/247-astros-and-skyfire-were-highlighted-at-kuwait-aviation-show.html), 20 February 2018, last viewed 25 October 2018. [iv] Caiafa, R., “Avibras reanuda el programa del misil de crucero brasileno”, Info Defensa website (www.infodefensa.com/latam/2018/03/28/noticia-avibras-reanuda-programa-misil-crucero-brasileno.html), 28 March 2018, last viewed 25 October 2018. [v] Landmine & Cluster Munition Monitor, “Brazil: Cluster Munition Ban Policy”, Landmine & Cluster Munition Monitor website (www.the-monitor.org/en-gb/reports/2017/brazil/cluster-munition-ban-policy.aspx#ftn12), last updated 26 June 2018, last viewed 20 September 2018. [vi] Amnesty International, “Yemen: Brazilian cluster munitions suspected in Saudi Arabia-led coalition attack,” 30 October 2015, available at https://www.amnesty.org/en/latest/news/2015/10/yemen-brazilian-cluster-munitions-suspected-in-saudi-arabia-led-coalition-attack/, last viewed 20 September 2018, Amnesty International, “Fresh evidence of cluster bombs being used by Saudi coalition forces in Yemen”, https://www.amnesty.org.uk/press-releases/fresh-evidence-cluster-bombs-being-used-saudi-coalition-forces-yemen, last viewed 20 September 2018. [vii] Human Rights Watch, “Technical Briefing Note: Cluster Munitions in Yemen,” February 2016, at https://www.hrw.org/news/2016/02/14/technical-briefing-note-cluster-munition-use-yemen, last viewed 20 September 2018, “Yemen: Brazil-Made Cluster Munitions Harm Civilians”, at https://www.hrw.org/print/298122, last viewed 20 September 2018. [viii] Armament Research Services, “Brazilian SS-60 cargo rockets employed in Yemen”, 30 October 2015, ARES website (www.armamentresearch.com/brazilian-ss-60-or-ss-80-cargo-rockets-employed-in-yemen/), last viewed 10 April 2018. 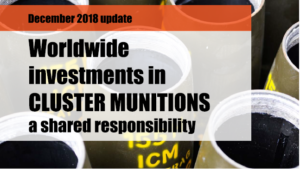 [ix] Landmine & Cluster Munition Monitor, “Brazil: Cluster Munition Ban Policy”, last updated 26 June 2018, Landmine & Cluster Munition Monitor website (www.the-monitor.org/en-gb/reports/2017/brazil/cluster-munition-ban-policy.aspx#ftn12), last viewed 20 September 2018. [x] Landmine & Cluster Munition Monitor, “Brazil: Cluster Munition Ban Policy”, last updated 26 June 2018, Landmine & Cluster Munition Monitor website (www.the-monitor.org/en-gb/reports/2017/brazil/cluster-munition-ban-policy.aspx#ftn12), last viewed 20 September 2018. [xi] Landmine & Cluster Munition Monitor, “Brazil: Cluster Munition Ban Policy”, Landmine & Cluster Munition Monitor website (www.the-monitor.org/en-gb/reports/2018/brazil/cluster-munition-ban-policy.aspx#ftn12), last updated 26 June 2018, last viewed 20 September 2018. [xii] M.Hiznay, “Subsidizing Brazil’s Production of Cluster Munitions”, 18 September 2014, Landmine and Cluster Munition Blog (https://landmineandclustermunitionblog.wordpress.com/2014/09/18/subsidizing-brazils-production-of-cluster-munitions), last viewed 20 September 2018. [xiii] Defesa Aérea & Naval, “Avibras oferece Astros 2020 para a Colômbia”, 21 June 2013, Defesa Aérea & Naval website (http://www.defesaaereanaval.com.br/avibras-oferece-astros-2020-para-a-colombia/), last viewed 16 November 2018; Defensa Nacional y del Mundo, “AVIBRAS y Missil cruzero MT -0 Matador”, 27 September 2013, Defensa Nacional y del Mundo website (http://defensanacional.argentinaforo.net/t6910-avibras-y-missil-cruzero-mt-0-matador, last viewed 16 November 2018; Defence Blog, “Brazil’s cruise missile development program enters final phase”, 28 March 2018, Defence Blog website (http://defence-blog.com/news/brazils-cruise-missile-development-program-enters-final-phase.html), last viewed 16 November 2018.